Our neighbor, Frank Hoyt Taylor, took advantage of the backhoe rented by a friend for grading a house site to dig a root cellar into his north-facing hillside. When the excavation was completed, it became clear that Frank had opened a hole into a cave, so he decided to gain some extra geothermal cooling by running pipes from the back of his root cellar into the cave. As with Emily's basement cut-off, I'm going to refer you to $10 Root Cellar if you want to read all of Frank's construction tips. That way, I'll have room in this post to sum up his results. 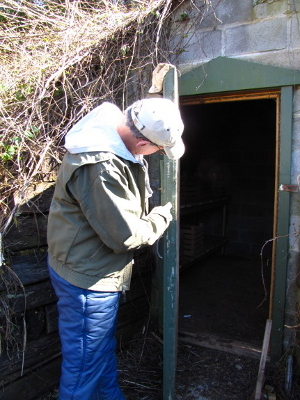 The weakest link in Frank's root cellar is the front wall and door, both of which are open to the elements (although insulated with foamboard). Ice does occasionally form on the inside of the exposed front wall, but temperatures in the main root cellar stay steady for most of the year between 50 and 55 degrees. 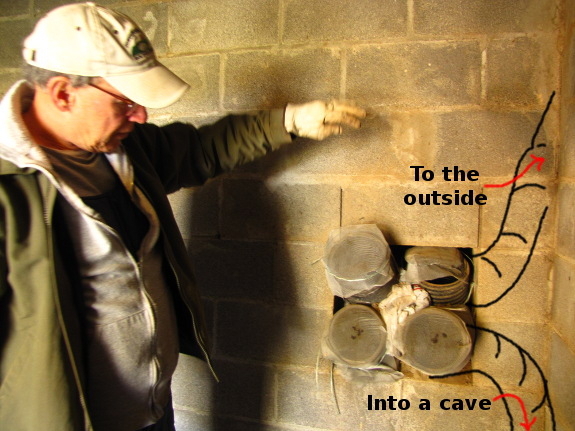 The real beauty of Frank's root cellar is the way he has created a very low-budget geothermal system by tapping into a naturally-occurring cave. The cool-air intake involves four drainage-tile pipes, two of which go directly to the outside and two of which dip into the cave. Unfortunately, the outside-air pipes were crushed when the backhoe pushed soil up against the back of the root cellar, so Frank feels the root cellar could benefit from more ventilation. He is considering adding vents at the bottom of the wooden door, but is happy with the outlet vent at the top of the cellar. 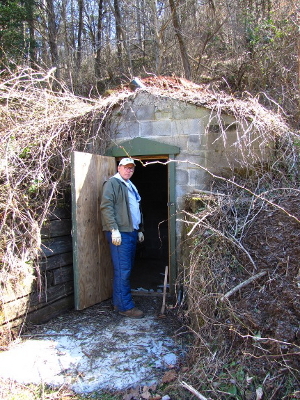 Frank built the root cellar with the help of his friend Jim around 2003. The pair didn't keep track of their labor (which was extensive) and didn't have to pay for the backhoe since it was already on-site. Those caveats aside, they estimate they built their cave root cellar for about $200. Frank enjoys the way cave salamanders share space with homegrown potatoes, and he notes that the structure could double as a tornado shelter if necessary. 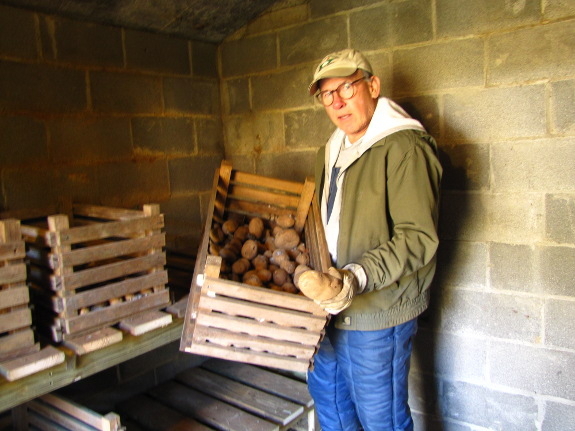 When the backhoe-driver came to check up on the cellar a few months after construction, he opined "That root cellar is worth a fortune," and Frank agrees.